We are currently doing an exciting and adventurous RV caravan trip through Baja California, Mexico, led by a travel company called Baja Winters Travel Club. There is far too much going on to cover it all in one post, so we are going to publish a whole series of informative posts about this trip. 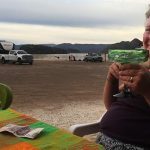 We hope this will be useful to anyone considering doing a trip with Baja Winters, or to anyone who might like to go RVing in Baja California, Mexico. We also want to share how much fun we are having. 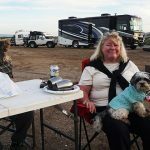 A week before the trip, we set up camp at the meeting spot, Potrero County RV Park, California. The park is six miles from the Tecate border crossing into Mexico. This RV park has the advantage of being situated just five miles from the Tecate border crossing into Mexico. It is also a very isolated and beautiful wilderness type park, with large sites and multiple oak trees. It’s a good place to have some quiet time and do some hiking. Surprisingly, we did have cell coverage there. There are limited shops in the area; however, if you are prepared to cross the border, there are all kinds of stores in Tecate, including a laundromat, an outstanding bakery, and many restaurants. On the US side, there is a small country store a short distance from the park on the 94, where you would be well advised to fill your propane tanks before you embark on a trip through the Baja. We were advised by our tour guides that it is best to always run your fridge on gas in Baja California, as the electricity is frequently too high and can quickly destroy your fridge. So, I filled our tanks at this store, and that was an interesting experience in itself. A tiny woman runs the store alone, and will lock the front doors while she goes out the back to fill your propane tanks on a rutted dirt road. Don’t even think about trying to take an RV in there – only tow vehicles could make it. Two days before starting our trip, the entire group assembled our RVs in the Potrero County RV Park in Potrero, California. This is a photo I later took of the entire group – minus Shawna and Tom, who unfortunately were not around for the photo. Also missing is Alison’s husband Ken, who very sadly had to leave us early due to illness. Two days before the trip started, we all met in the pavilion at Potrero County RV Park. There, we met Wagon Masters John and Becky Smith, as well as Tail Gunner Jerry and his wife Kathy. Becky described the entire trip to us, with maps, and John talked about the rules of the road and other important aspects of how we would caravan together. There are some vital differences in the way you drive in Baja California, Mexico, which I will explain in this post. We got our binders with our daily trip logs, maps, and t-shirts. We also met most of our group. The next day, we shared rides in our tow vehicles to drive to the Tecate border post, where John and Becky led us through the process of exchanging US dollars for pesos (no Canadian dollars or credit cards accepted). We also went through the bureaucratic process of getting our tourist visas. This basically involved standing in one line to fill out paper work, then standing in another line to pay $35 (or the equivalent in pesos), and then standing in the first line again to get our paper work and passports stamped. Note that it is essential to keep your receipt of payment at all times. We put ours into our passports and put rubber bands around them to keep them safe. Then, John and Becky led our group on a walk into Tecate to visit the famous bakery, El Mejor Pan de Tecate. It was probably the biggest bakery I have ever been in (anywhere, not just in Mexico). Everyone enjoyed their purchases; I unfortunately had to pass due to gluten sensitivity. Some of our group peeled off to have lunch at one of the many restaurants recommended by John and Becky. Then, we all walked back to our vehicles and drove back to camp. Back at camp, we had one free day to deal with any last-minute preparations. Maggie and I had already done most of this, including getting unnecessary items into storage. Those included our electric bikes, as we did not want the extra weight or the responsibility of keeping them safe. We had been warned that bikes are often stolen on the Baja. We were glad to have the day, as it turned out that the CB radio we had had professionally installed in Canada was not working properly. The expensive install turned out to be rubbish. The aerial was too small and too close to our car aerial to work properly. Clearly, the CB radio had been installed but not tested. We will be having words with the company when we return to Canada. This was the first of many learning experiences – don’t assume that because something was expensive, it was necessarily done well. When undertaking a trip like this, test everything in advance if you can. This was a real problem because CB radios are absolutely essential to travel in a caravan of RV vehicles. Luckily, tail gunner Jerry was there to save the day. A Vietnam vet and ex helicopter mechanic (and all-round fun guy), Jerry can figure out most technical problems. We ended up removing the car aerial and moving the CB aerial further out. We still didn’t have a great CB radio, but at least we could hear and be heard. That night, Maggie made a roaring fire and we invited our new friends over to have sun downers together and get to know each other. Departure Day dawned with many butterflies in our stomach, as we stood on the verge of quite an epic trip into a foreign country. We were up bright and early, but for some reason had a little difficulty hitching. Once again, Jerry came to the rescue. This time, the cure was to use a mallet to force the hitching of our fifth wheel. A couple of days later I lubed the hitch, and that seemed to finally help. 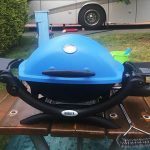 We were already experiencing the benefits of being in a guided caravan, rather than embarking on a trip like this on our own. After months of sorting out problems on our own, it was a huge relief to have more knowledgeable people to help us out. After dumping our tanks as fast as we could at the dump station, we finally joined our group in our line-up, one minute before departure time at 9.00 a.m. Then we all set off in a line to the border. This was our very first experience of driving in a caravan, and it was both interesting and reassuring. John drives the lead vehicle, with Becky beside him, cheerfully manning the CB. They don’t tow anything – they need to have the flexibility to do a U-turn if any member of the group needs help. Becky does a roll call, calling each of us by our call signals, to make sure we are present and can hear and be heard. We chose the call signal “Tardis.” This is a reference to my favorite sci-fi show, Dr. Who, which features a space ship that is “bigger on the inside.” We are always amazed at how roomy our 30-foot Denali fifth wheel feels, so we have named her the Tardis! After that, we all set off at a safe speed, maintaining enough distance between us for an 18-wheeler (or any other vehicle) to zig-zag between us, if need be. We are of course slower than the average vehicles, so this is essential caravan etiquette. Whenever a vehicle comes up behind the caravan, tail gunner Jerry notifies the wagon masters (and everyone else, as we are all listening in, all the time). Then, we work together to help the would-be over-takers get by. This gets particularly interesting in Baja California, Mexico, where different road rules apply (as I will explain below). Also, Becky notifies us whenever there are oncoming vehicles, as in “oncoming 18-wheeler, followed by two 4 wheelers.” This is useful in the Baja, where almost all roads are single-lane and narrow (two lanes, with just one going in each direction). When I say narrow, I mean very narrow. Standard width, but with shoulders that are often just an inch or two wide before a steep drop-off. This means that maintaining your lane position is critical. It also means that if oncoming vehicles are too close to the middle line, you might lose your side mirror. Fortunately, we quickly found that the drivers of large vehicles such as 18-wheelers in Mexico are incredibly good drivers, and take great care to give you as much space as possible. I saw one so far from the middle line that I held my breath, because on the other side of him was a sheer drop. But of course, he made it. That sort of information is invaluable when you are on this kind of trip. Also, Becky shares fun facts about the areas we are driving through, based on her extensive knowledge. Clearly, she has loved the Baja for a very long time. 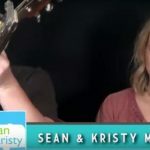 She and John own a home in Baja California, and have led many caravans through the area. They are scaling back now as they get older, and I would advise you to enjoy one of their trips before it’s too late. We all travel with our headlights on, plus we all have identifying decals at the front and back. This is to help us all keep in touch and recognize each other. As mentioned, the roads are narrow and single-laned. Apart from that, it is a very mountainous country, so expect a lot of ups and downs, and many curves. While most of the roads are paved and good, there are long sections where they very definitely are awful, with multiple pot holes and even some sections that are dirt. Also, some of the access roads to RV parks are very rough and bumpy, and certainly are never paved. This is one thing that is completely different. When on a highway on the Baja, never, ever use your left turn signal to indicate a left turn. Instead, use it to let the driver stuck behind you know when it is safe to overtake. The way it works on the caravan is that after tail gunner Jerry lets us know there is a vehicle behind wishing to overtake, wagon master Becky lets us know when it is clear ahead. Then, we all switch on our left turn signals, and the driver starts the task of overtaking each of us – sometimes one at a time, and sometimes several at a time. Some of the drivers seem to like to live dangerously. With the left turn signal dedicated to telling other drivers to overtake you, you cannot use it to indicate a left turn when you want to turn left. Instead, you slow right down, wait until it is safe, take command of the oncoming lane, and then gently ease off to the left at about a 45-degree angle. This sounds scarier than it actually is. It helps that traffic is quite light on most of these highways. Baja California is a mountainous semi-desert with very little water and few natural resources – with the result that it is very sparsely populated. The exception is the wine country in the north. Our first day’s traveling was only 50 miles, but it still took about three hours, because of the border crossing, plus stopping to shop about a mile past the border. After you cross the border, take the first left (before the archway) and the first right, and drive straight, past the MacDonald’s on the left. About half a mile later, on the right, there is an Auto Zone where you can park and run into a large grocery store, the CALIMAX, that has every kind of grocery and alcohol you might need. 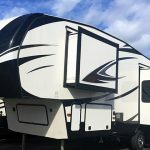 When we stopped at the Auto Zone our fifth wheel snared a banner that was hanging far too low. Our fellow travelers quickly came to our assistance, with Jim Braun climbing up our ladder to release it. Most of us needed to stock up at the CALIMAX, as we had been warned that all kinds of things might be confiscated at the border – notably produce, dairy, and meat of all kinds. However, as it happened, the border crossing was uneventful. We were not asked about paper work for our dogs (although we had every possible vaccination certificate with us, just in case). We were not asked about food. One of our party was asked if she had any alcohol, and she said no, and they took her word for it. Fortunately. Also, to our amazement, they did not ask to see our passports. The border guards did check the registrations for our rigs (apparently in case they were stolen and we planned to sell them in Mexico), and they did ask us to open up our rigs to have a cursory look inside. Many of us had visible food items on the forbidden list, but nothing was confiscated. This was the first of many security checks where the officers were polite and friendly – and sometimes very cheerful as well. One officer sang the entire time he was checking the contents of our truck! Throughout the Baja, expect to encounter military inspections along the road. Have all your paper work ready, although it is seldom asked for. Also, there is an agricultural check at the border between the states of Baja California and Baja California Sur. There, you need to have twenty pesos ready to pay for your tires to be fumigated (takes about two seconds), and you may have your fruits and vegetables confiscated (although none of us did). Lenny breaks is the name Baja Winters has given to bathroom stops. Apparently, they are named after a previous caravanner who famously needed many of them! Anyone who travels by RV knows what a problem these breaks can be, as you may travel many hours without finding anywhere suitable to stop. It is a great relief to have these pre-planned for you. 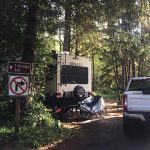 Baja Winters has identified many stops along the way where it is possible to park a caravan of ten rigs for bathroom breaks. At most of these there are public washrooms (bring your own paper! ), but at some it is necessary to use you own traveling toilet. On the first day we traveled about 50 miles on Highway 3 through Baja’s wine country. At this point it seems like a thriving country, with endless miles of vineyards on each side of the highway. It was very reminiscent of the Napa Valley in California. Sordo Mudo RV Park in the wine-producing Guadalupe Valley was easy to get into, with a short dirt road access. This was also where Maggie flawlessly executed her first left-hand turn, Baja style! Maggie did most of the driving in Mexico, as she is a better driver and has calmer nerves. This is not a situation for false pride – the towing is challenging and should be handled by the most competent driver, regardless of gender. A third of the rigs in our caravan were driven by women. The sites at the Sordo Mudo RV Park were large and pull-through, so that everyone was quickly parked. This does not happen randomly – the wagon master and tail gunner get it all organized and directed, and very often lead you to your spot. The park offers full hookups, including sewer. They are also ready to help if you need help parking. This can be directing you, but they are also prepared to get in your vehicle and park your rig if required. Maggie declined every time, as she is honing her parking skills. 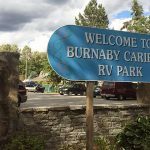 It is very helpful to have an experienced RV driver direct you with parking. Maggie was not the only person on the trip who was happy to learn from the expertise of our leaders. Having parked, we set off in our tow vehicles for the Adobe Winery. Driving through a somewhat ramshackle town, you would never think you are about to encounter a spot where a gourmet tapis-type lunch is served from a food truck! But that is what we found, thanks to the advance spotting that John and Becky have been doing for decades. The lunch was delicious, and the company was great. After that, we drove a short distance to the El Cielo Winery. At the El Cielo Winery we enjoyed a guided tour conducted by Lily, a young woman who plans to do her Master of Wine, and who is extremely knowledgeable and speaks excellent English. Maggie and I thought that the tour was superior in terms of knowledgeable content to any we had experienced in the Napa Valley (we wrote about our fabulous time in the Napa Valley wineries here). These two events were paid for by Baja Winters. That night we unhitched and again had problems, which Jerry again helped us with. This time, the hitch was refusing to unhitch, and the solution was to “rock” back and forth by going forward an inch and then backwards an inch. That was the only night of the five-day drive that we unhitched. 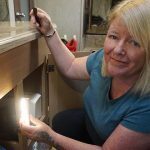 After that, we decided it was too much trouble to hitch and unhitch every day, so we just “roughed it.” As we were not 100% level, we did not extend our heavy living room slide, but we had to extend our kitchen slide, in order to access our food. That seems to have been fine. That evening we got together for the daily group meeting led by our wagon masters, in which they explained the plan for the next day. After that we had Happy Hour with our fellow travelers, and had a great time on our first night in Baja California.